Day 3 of 3 for sticking to my meal plan, tracking calories and water intake; I'm on a roll! When I got home from work, I quickly made dinner. 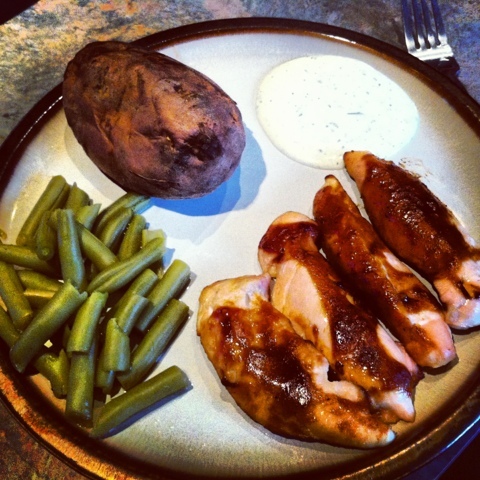 We had the best BBQ chicken (baked) with a side of green beans and a baked yam. It was delicious! After dinner, my husband and I went to visit my sister-in-law! We had a great time visiting and helped her tie-dye some t-shirts while we were there! Did you know that you don't have to use a bucket of dyed water anymore? I thought we'd be tie-dying what I believe now to be "the old fashion way" but learned something new when we arrived; you can now tie-dye using squeeze bottles! Something that hasn't changed though is that you still have to wait the 6-8 hours for the shirt to dry before you can see how they turned out. Not to worry though, my sister-in-law said she'll text me a picture of the results.